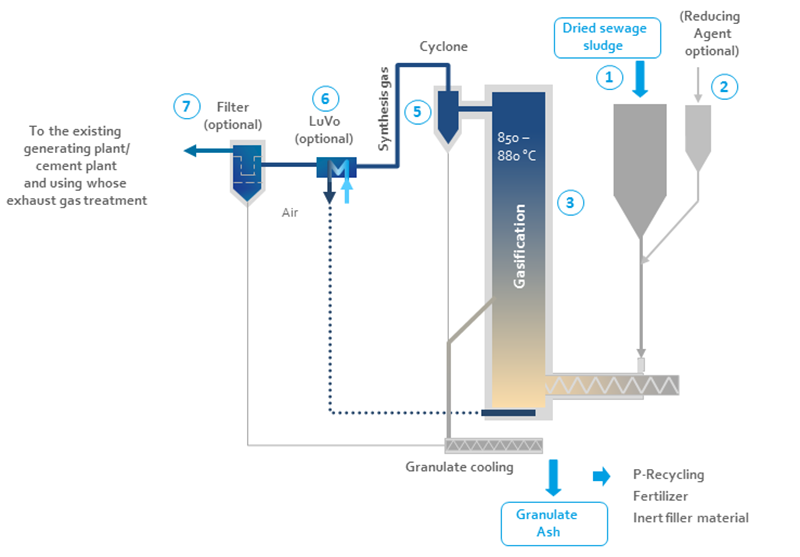 The solution of auxiliary firing is aimed at power plants and cement plants that, despite the recent ban on mixing sewage sludge ash with ash from other fuels (Sewage sludge Ordinance, AbfKlärV), would like to carry out co-incineration of sewage sludge. With the SynGas Auxiliary Firing Module, the sewage sludge is gasified in a separate SynGas fluidized bed reactor and the synthesis gas is fed to the power plant or cement plant as a gaseous substitute fuel. The resulting sewage sludge ash is collected separately and, as with our other solutions, is available in the same decontaminated and low-carbon quality for further recycling or potential phosphorus recovery. The expenditure for synthesis gas treatment prior to the transfer point to the power plant can be adjusted according to the customer’s requirements. Simplest form of the fluidized bed gasification technology that has been tried and tested in our company for years. From the silo, sewage sludge with a dry content of 85% – 95% (1) is conveyed together with limestone (2) into the fluidized bed gasifier (3). The added limestone binds sulphur and is therefore the first desulphurization stage. The high gasification temperature of 850 °C completely destroys all toxic substances in the sewage sludge and removes heavy metals such as mercury or cadmium from the valuable sewage sludge ash. It ensures that the vital phosphorus in the ash granulate is suitable for use e.g. as fertilizer. The almost carbon-free ash granulate (4) is removed from the process via a sluice and collected. The cooled and de-dusted synthesis gas is introduced via a special lance into the combustion chamber of the power plant where it is combusted. In this way, the energy in the power plant process can be used with high efficiency without the sewage sludge ash being diluted with the other ashes. The flue gas cleaning takes place together with the exhaust gases of the power plant without any further changes in the power plant process. Flue gas cleaning requirements may be less challenging, since the combustion of the synthesis gas can take place much cleaner than the combustion of the solid.